Keep your favorite songbirds protected from the elements while they dine using the Brome Clear Squirrel Buster Plus WeatherGuard. This generous, 13" diameter shield is specifically designed for use with your existing Brome Squirrel Buster Plus Squirrel Proof Bird Feeder (not included), installing on the piece with ease. The guard rests near the feeder base, keeping the feeding ports and feeder ring protected from rain and snow. Its clear body ensures the avian activity remains nicely visible, while the polycarbonate construction is protected from UV rays, lasting for many seasons. The unit slopes downward slightly, directing precipitation away from the feeding area, and a small lip around the base adds a finished look. 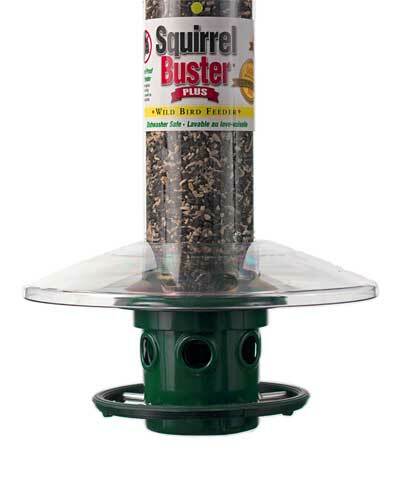 Help your feathered friends remain dry while they feed from your Brome Squirrel Buster Plus Squirrel Proof Bird Feeder (not included) with this Clear Squirrel Buster Plus WeatherGuard. Lifetime warranty. Note: This description refers only to the Brome Squirrel Buster Plus WeatherGuard, Clear, 13" dia. The feeder shown is not included.